best-ever on-road dynamics together with class-leading Land Rover all-terrain capability. The new technology-packed Range Rover Sport presents customers with a more assertive and muscular exterior as well as more luxurious interiors. "It gives me great pleasure to launch the all-new Range Rover Sport in India. This premium sports SUV has reached greater heights in design, technology, driving dynamics and interior luxury, which together takes it to another level. 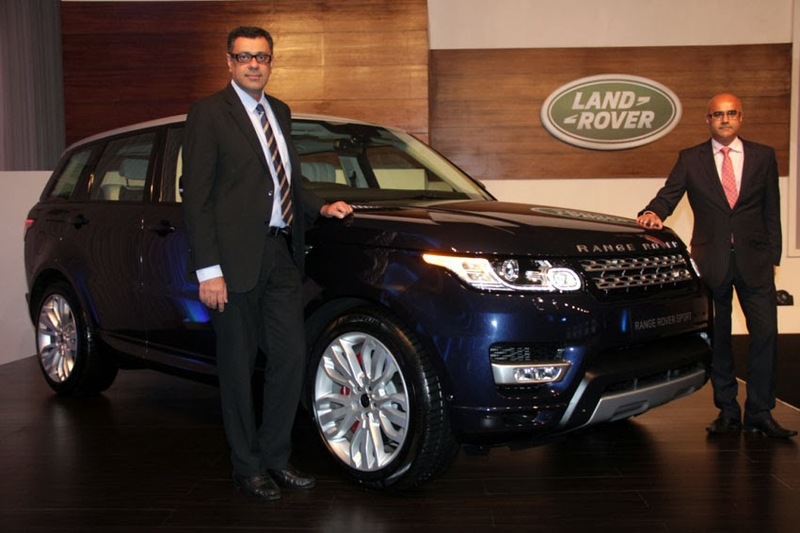 The engines with their superior technology, provide better fuel efficiencies while the new exterior lines and class defining interiors will certainly turn heads and add to the comfort and luxury that one expects from Land Rover," said Rohit Suri, Vice-President, Jaguar & Land Rover India. "Land Rover customers desire a brand that reflects their personality, has unrivalled confidence and shows capability with composure. The launch of the all-new Range Rover Sport, reiterates our firm commitment to offer customers and prospects, products that have exceptional design and technology at the core." Both 3.0L SDV6 Diesel and 5.0L S/C Petrol engines are equipped with optimum power output, high torque and acceleration, thereby increasing engine performance. The distinctive design of the all-new Range Rover Sport builds on the core strengths of Range Rover's Design DNA. Optimised volume and proportions give the vehicle a modern, assertive, powerful and muscular stance. There are new interpretations of the signature clamshell bonnet, floating roof and side fender vents and the eye-catching details in the front lamps, feature the trademark inter-locking circles and distinctive LED signature graphics. The all-new Range Rover Sport is the fastest, most agile, most responsive Land Rover ever. It is the first vehicle in its segment with lightweight aluminium construction with its platform being 39 per cent lighter than its predecessor. The latest 8-speed transmission can be operated in full automatic mode via the centre console mounted shifter or by steering wheel paddles placing control at your fingertips. The state-of-the-art lightweight 4 corner air-suspension delivers class leading wheel travel, providing exceptional wheel articulation and variable ride height. The interior has a sophisticated and modern appearance, incorporating distinctive Range Rover Sport design cues and providing the driver with a luxurious and sporting cockpit. For the new model, the strong, architectural forms of the design have been enhanced by a cleaner, purer surface treatment, beautifully executed using top quality materials. Building on the signature Range Rover Sport interior architecture, the centre piece of the cabin is the bold intersection between the strong horizontal elements of the instrument panel and the vertical lines of the centre stack. The dynamic character of the cockpit is enhanced by the faster angle of the centre stack, with its striking satin chrome pillars which flow from the instrument panel through into the rear cabin and the aluminium accents that flow from the centre console into the fascia. The sporting ambience of the interior is also reflected in the smaller diameter, thicker rimmed steering wheel, vertical gear shifter and seats with more generous side bolsters. The front and rear seats feature a more sculptured design with enhanced padding to the front and individual seating in the second row. Special attention has been given to providing increased rear seat comfort, offering improved rear legroom (+24 mm knee room) and shoulder-room. The all-new Range Rover Sport has a starting price of Rs. 109.91 lakh for the 3.0L Diesel SDV6 S variant and goes up to a price of Rs. 165.85 lakh for the 5.0L V8 SC Petrol Autobiography variant. All prices quoted are ex-showroom, Mumbai (pre octroi).